Joe Pallotta began his career as a mold maker at 19: “I didn’t know anyone at the time. 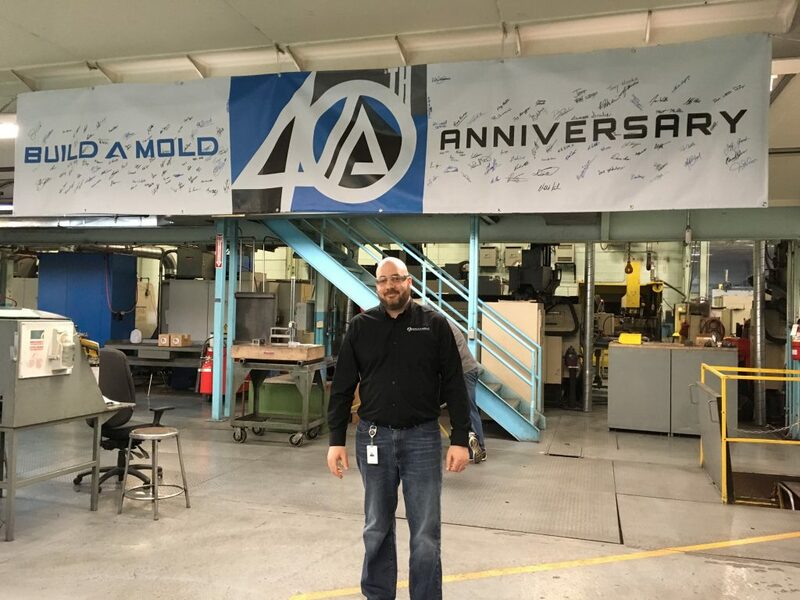 I just knew it was a great industry to be a part of.” Starting as an apprentice, he moved his way up through Build-A-Mold to becoming an Engineering Supervisor. Build-A-Mold began forty years ago as a two-man mold shop in Windsor. Since then, it has grown into one of four brand divisions of Plasman Group. Build-A-Mold is known for being a “one stop shop” for injection molds while offering a variety of services from design to tooling for the automotive industry. Joe has spent his career growing alongside the tool and die shop, working through different departments. Now he’s involved in product design from a tooling perspective, looking for ways to improve the products. The tool and die industry is expanding in Windsor-Essex and many jobs in the field are in-demand. Learn more about jobs like Joe’s with our Career Profile on Industrial Engineering and Manufacturing Technologists and Technicians. What do you do as an Engineering Supervisor? 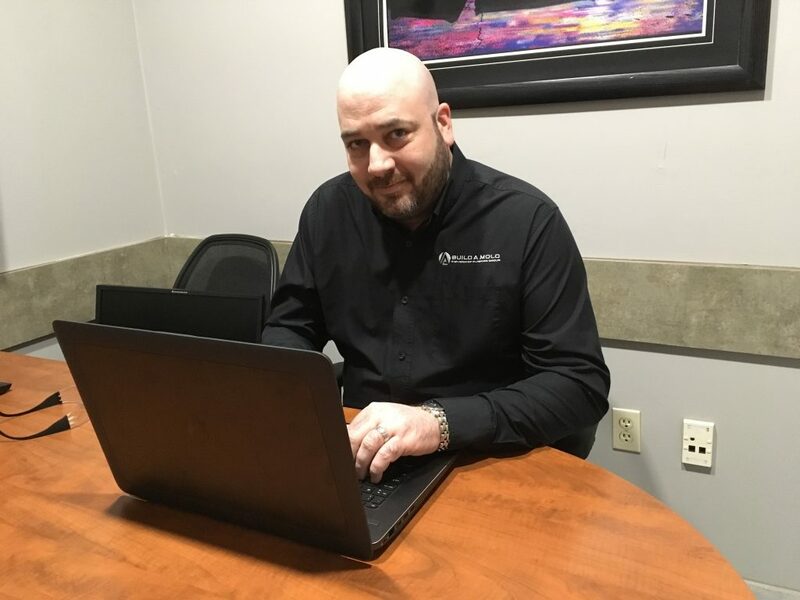 I oversee the design department for plastic injection molds that are designed in our facility, as well as upfront feasibility new parts and projects that are coming through the company. I’m in the office early, usually 6AM every day. I start off by organizing tasks for my team and coordinating what the day will entail. I spend a majority of my time in meetings, either internal within our company or external with our valued customers. I do a lot of troubleshooting and upfront feasibility on a day-to-day basis as different things arise and evolve. Build-A-Mold offers a variety of services from design to tooling. We make class-A exterior painted parts for automotive: wheel flares, rocker panels, body-side molding and more. For third party customers, we also do under-the-hood components: intake manifolds, air boxes, resonators. We’re a one stop shop and unique in our capability to offer precise “part to print”. We do part design to shipping to the OEMS [Original Equipment Manufacturer]. So essentially, we see the full process. Above all, Build A-Mold is a part of the global Plasman Group family which is home to the best and brightest in the industry. We thrive on pushing the boundaries of what’s possible to bring the very best to our customers – from design to finish. I knew I wanted to work with my hands at a young age. I wanted to be in the trades, so I chose the tool and mold industry. I felt like it had the most potential for growth. I started as a one-year general machinist eighteen years ago at St. Clair College. I then signed up as a three-year apprentice at Build-A-Mold as a mold maker. After my apprenticeship, I was moved into the engineering department as a mold designer and then eventually grew into the engineering manager. What was the apprenticeship like? It’s a lot of hands-on. You go to school for three hours a night twice a week while you’re working full-time. I was working the night shift and I would go to class and then come back. It’s bookwork but also hands-on. What skills have helped you move up in your career? When I started off, it was the ability to work in different departments within this company. I worked in several areas on the shop floor as well as in engineering. It gave me perspective of every department and what it takes to build a tool, which gave me the knowledge and experience to be where I am today. When I was young and eager, I just really wanted to push myself to learn everything I possibly could. I saw that there was potential at Build-A-Mold and wanted to grow. As you get to learn a skill, you want to move on, but the growth doesn’t always happen that rapidly either. If you’re patient and committed, the opportunities will come. It’s important to show dedication and discipline so management can help groom you along. If you are asking questions, applying and want to learn, this company will give you all the support and knowledge they can. I’ve learned a lot about the industry and about how to work with people. Teamwork is important and working with many talented individuals with different skill sets really helps. I’ve been doing this for eighteen years. As technology advances, I’m always learning something new. That’s the great thing about this industry. It’s always challenging and exciting. Why is Windsor a unique place to work? Windsor is a mecca for the tool and mold industry. We’re home to approximately 25% of North America’s tool and mold industry and account for 80% of Canada’s sector. There is roughly 200 tool and mold shops in this region. There is a ton of opportunity in this industry for years to come. When I started, Plasman Group was a company of only five plants and now Plasman Group represents 16 manufacturing plants worldwide. The company footprint has really grown which means there is a ton of room for development within the company, which is really appealing. You really get to see the whole picture: chroming, painting, plating, assembly and shipping right to the OEMs [Original Equipment Manufacturer]. What advice would you give people looking to get in to the industry? Ask a lot of questions and don’t be afraid to get help from anyone. There are a lot of knowledge and experienced people in this area you can learn from. There is a huge shortage of skilled labour right now, so it’s a good time to get in because the industry needs a younger demographic that is ambitious and dedicated. Especially when beginning their careers. I like people who apply themselves, aren’t afraid to ask questions, and have a willingness to learn. It will give them good growth and experience in the future.